Make a subtle statement with your outgoing mail while portraying a professional appearance when you choose these basic return address labels. An understated beige background and classy white pinstripes combine for an unobtrusive finishing touch. You don't need extra attention, just an easy and attractive way to prepare letters and packages. These labels are printed on stock with a self-adhesive backing. That's going to make the often annoying chore of filling out envelopes a whole lot easier. All you need to do is stick them on anything you put in the mailbox. 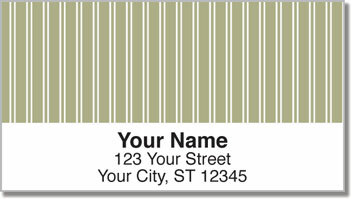 Make Beige Pinstripe Address Labels yours today! If you're looking for a different color, we have three other options as well as a multi-color design.